Cafe-hopping gets a bad rep as a basic “white girl” activity. But honestly, what’s wrong with that? It’s hard not to love lazing in a beautiful cafe, sampling delicious food at each turn. 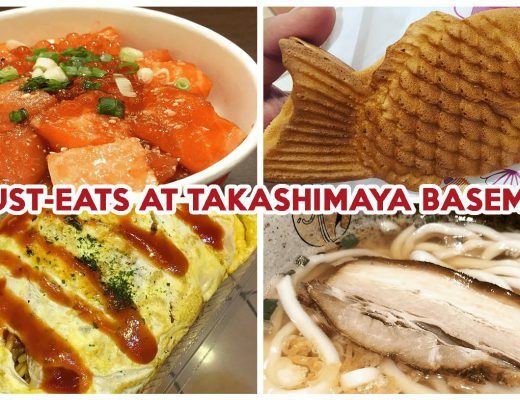 Telok Ayer is well-known for its blend of street and cafe food in the CBD, with hawker behemoths like Amoy Street Food Centre just a stone’s throw from hipster hotspots such as Park Bench Deli. With such an abundance of cafe options in the area, it may be difficult to decipher what each has to offer. 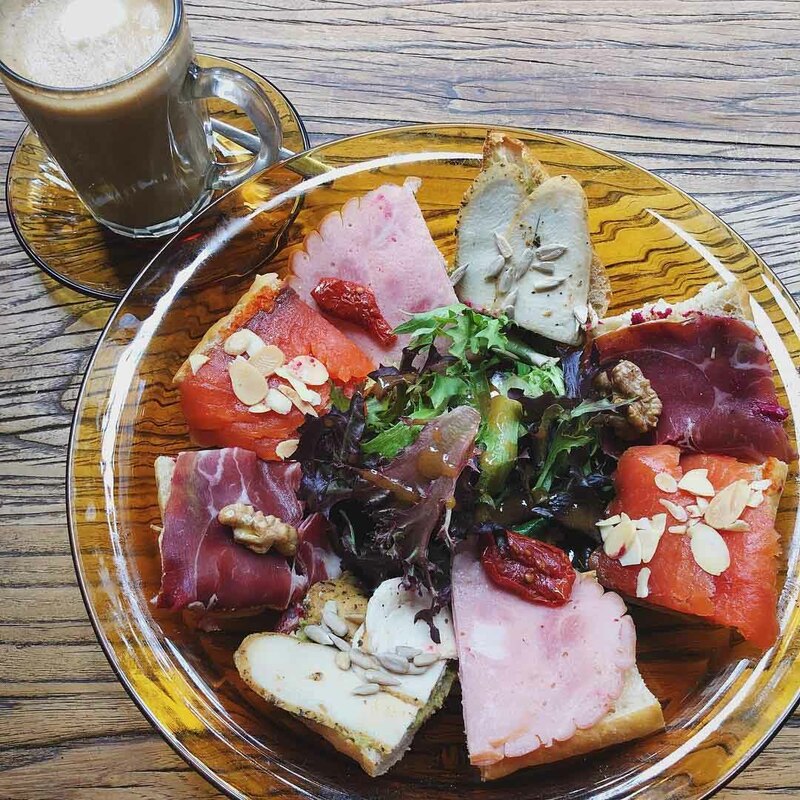 To help, we’ve compiled a list of 10 noteworthy cafes in Telok Ayer to reward yourself after a gruelling spin class. 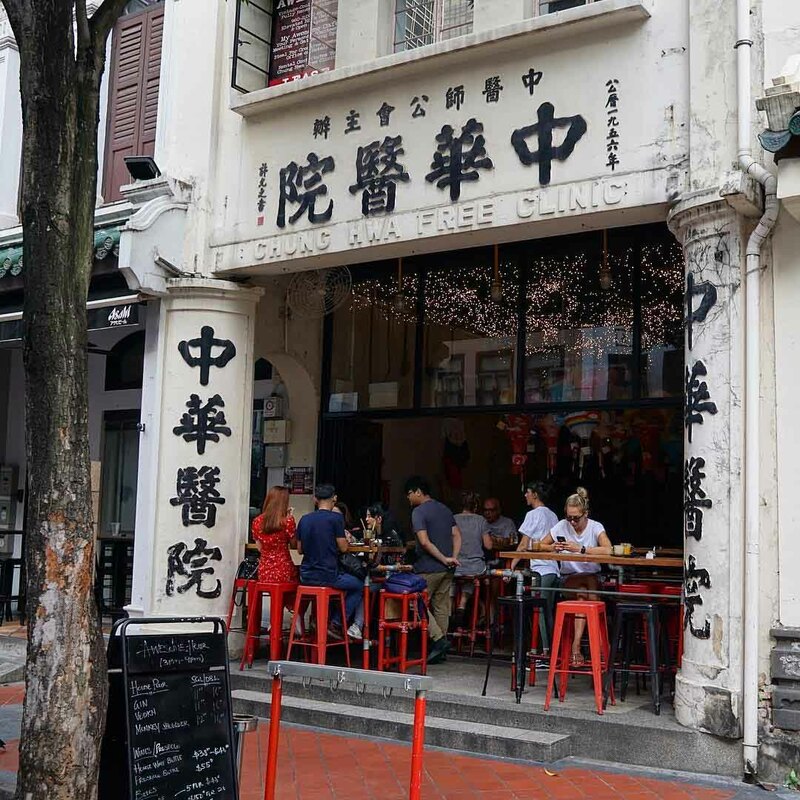 Since raising its shutters in 2014, Frenchman Franck Hardy’s My Awesome Cafe has become one of Telok Ayer’s best known hangouts, renowned for its tasty food and old-world charm. The cafe complements its throwback Chung Hwa Free Clinic facade with retro, industrial fittings inside. The bare bulbs and school desks imbue the space with vintage Singaporean charisma, even as you chow down on European cafe fare. Their signature My Awesome Salad ($15++) is a fan favourite here, flaunting smoked salmon, herby chicken breast, duck rillettes, tomatoes and avocados with a cluster of salad leaves. 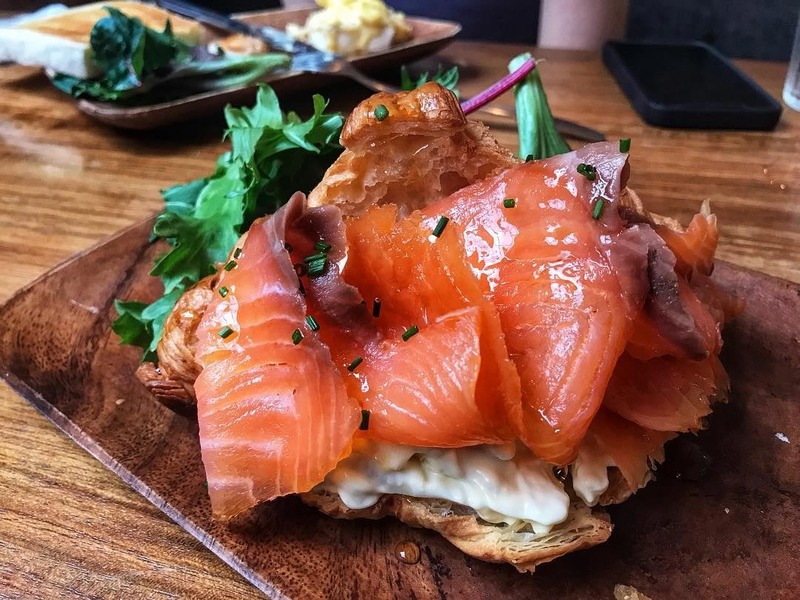 I’m a certifiable carnivore who usually avoids ordering salad, but the allure of velvety duck rillettes and sumptuous strips of smoked salmon is wickedly tempting. An awesomely expansive menu is available here, particularly for drinks. Home-Made Organic Hibiscus Soda ($5++) makes for a refreshing pick-me-up, along with the usual tea and coffee. If you want a boozy buzz, there’s also a wide selection of alcohol, including the interesting Dragon Ginseng Wine ($25++ for 125ml). While our previous French cafe integrated Asian culture, Merci Marcel remains firmly entrenched in its roots, making customers feel like they’ve been whisked off to a pretty Parisian street. 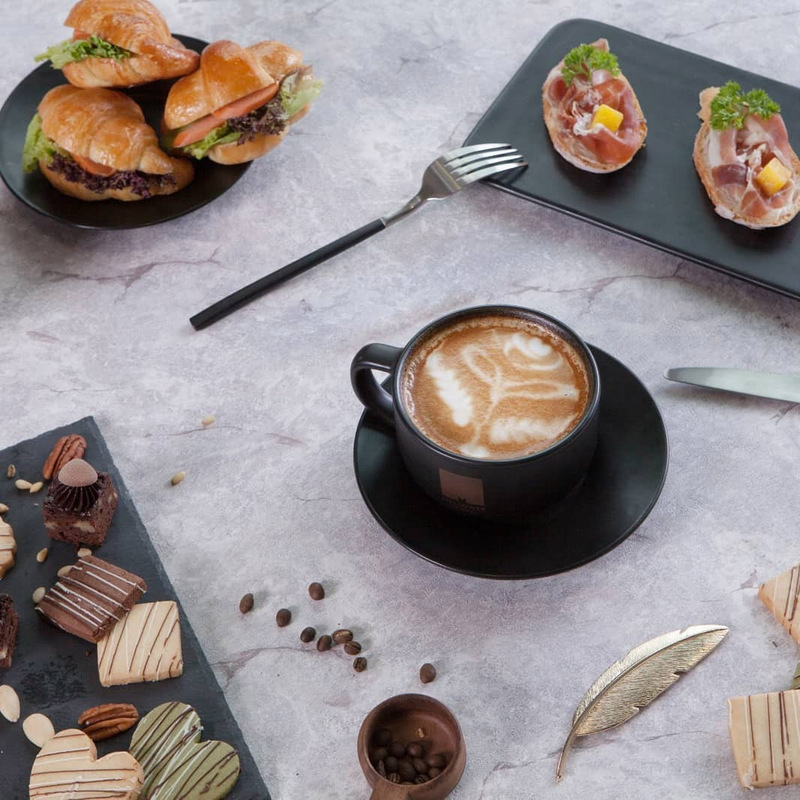 Expanding from its original space in Tiong Bahru, this Club Street outlet has a stylish yet relaxed vibe, the kind of place you’d imagine a gaggle of pretty Parisian girls would spend their Saturday at. 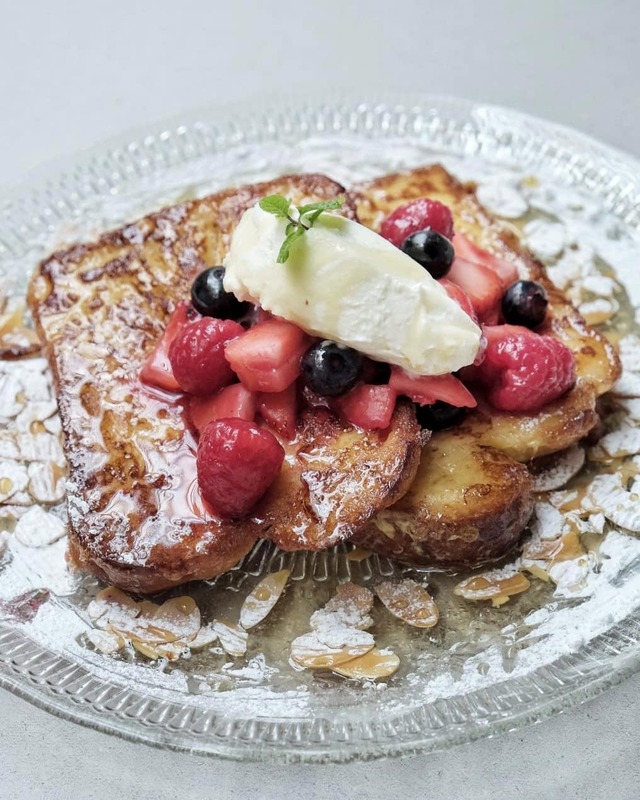 It seems almost rudely stereotypical to order French Toast ($18++) at a French cafe, but whoever Marcel is, his rendition of this breakfast classic is stonking. Fluffy and lightly crisp brioche slices are bathed in berries and honey for a decadent way to start the morning. Marinated Crab Tartine ($18++) is a less conventional route for brunch, featuring sourdough bread capped by marinated crab and avocado. During dinnertime, sharing plates dominate the menu, with Tarte Flambee ($25++), a thin crust pizza with blue cheese, apple and bacon, and Pan-Seared Hokkaido Scallops ($38++) ranking amongst the most popular choices. 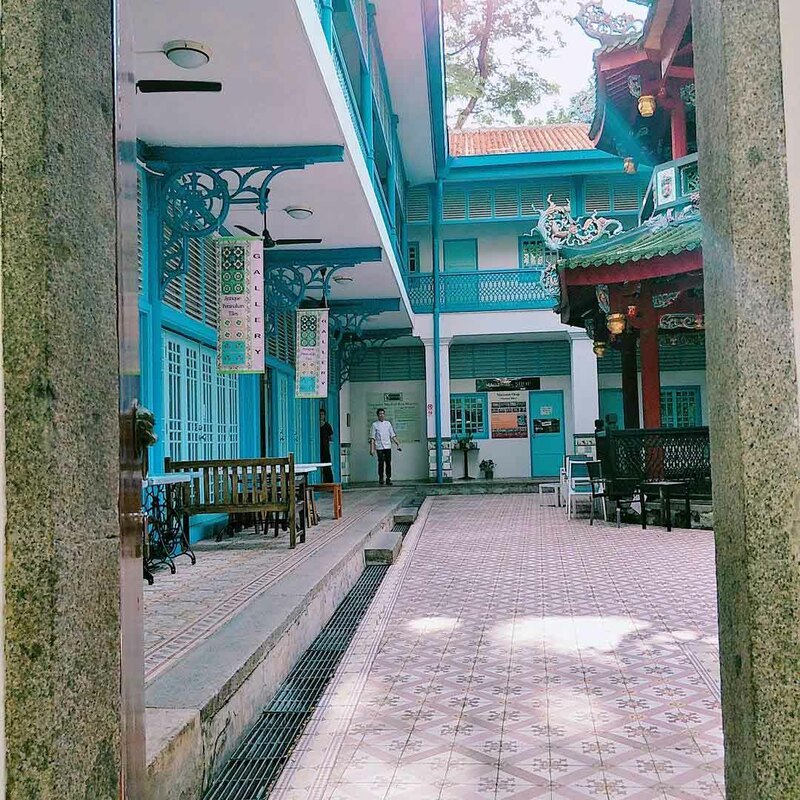 Set in an old Chinese girls’ school and occupying the same building as a Peranakan tile gallery, Chong Wen Ge Cafe is shrouded in local history. This quaint Nyonya cafe rolls back the years, evoking scenes of 1950s Singapore. It’s a snapshot frozen in time, preserving our heritage as its surroundings strive for endless modernisation. 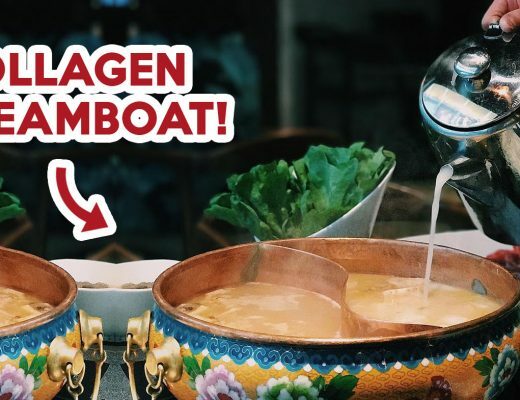 Serving up an authentic Peranakan menu, this is a cafe you’ll be happy to bring your Nyonya grandmother who scoffs at egg benedicts. The Nyonya Laksa ($10.80) exudes the distinctive aroma of laksa leaves, and showcases plump prawns and clams in place of cockles. 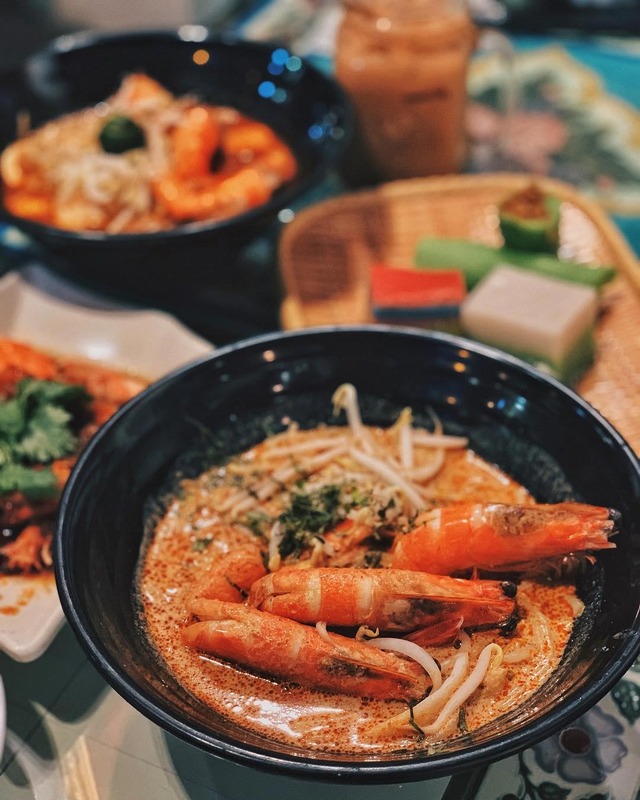 Sambal Prawns with Rice ($10.80) is a quintessential Peranakan staple, complete with a side of fresh house-made achar and robust rempah, or spice paste. Ask your nearest “white girl” about their favourite Telok Ayer cafes and Sarnies will invariably enter the conversation. 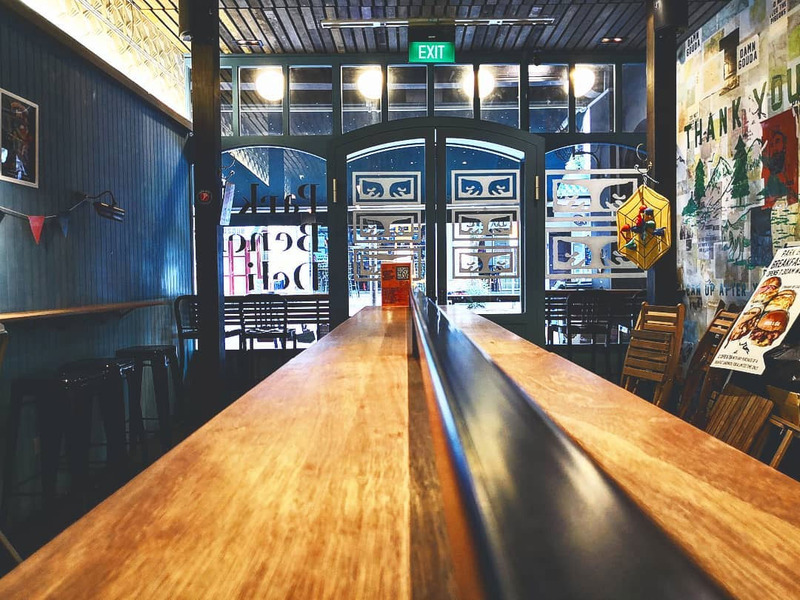 This Australian-inspired cafe has become an absolute fixture in Singapore’s cafe scene, with its unpretentious and comfortable atmosphere attracting a loyal legion of regular customers. “Sarnie” is a British-Australian slang for sandwiches, so you won’t go wrong ordering any of their eponymous items. Chicken Schnitzel ($14.80++) adds German influence to your lunchtime routine, featuring thick and juicy fried chicken cutlets between white bread. 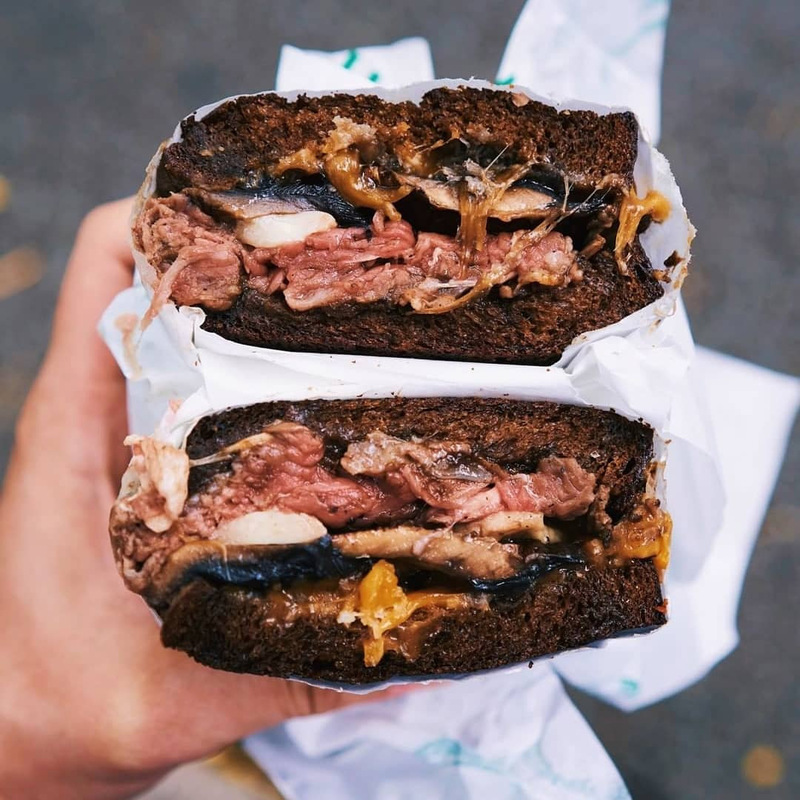 Grass Fed Steak ($16.80++) is their take on the classic roast beef sandwich, with a layer of steak sauce that coats sauteed mushrooms, onions and tender strips of seared steak. Few doors down from Sarnies is a modest muffin purveyor, The Muffinry. In contrast to its busy neighbour, this three-story loft cafe is a lot quieter, great for a peaceful and cosy afternoon get-together. What catches the eye as you enter is a curious jumble of name tags and coffee bean-filled test tubes. Christened “The Bean Programme”, it’s their cute form of a loyalty system. Every drink purchased allows you to add a bean to your tube, and once it’s full, you’re entitled to a reward. We aren’t talking about a lame drink upsize here, but a cup of coffee and two free muffins. Get drinking. 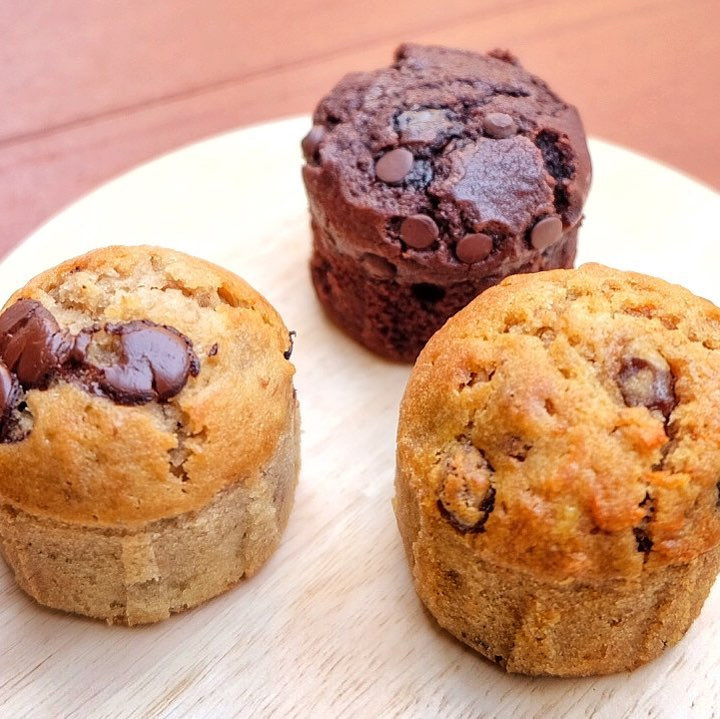 Shockingly, The Muffinry specialises in muffins. Typical variants like Double Chocolate Muffin ($2.80) can be had, but more unique crafts like Lime, Macadamia and White Chocolate ($2.80) pique our interest more. Their muffins perfume the air with that immensely satisfying freshly-baked smell, and are wonderfully moist within. Clearly, the owners know the muffin man. More substantial plates are also available. You wouldn’t expect a bakery to make their own char siew, but this humble cafe goes through that labour-intensive process process to stick it in The Char Siew ($9.20) sandwich. It’s understandable to be sceptical of a muffin joint attempting this hawker classic, but their glazed pork extravaganza is genuinely good. 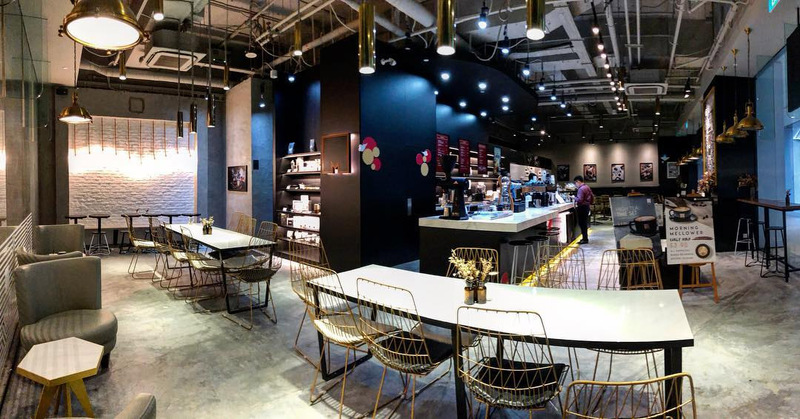 Already sprouting up at three locations, Shanghainese coffee specialist Mellower Coffee has been a revelation since landing on our shores in 2017. 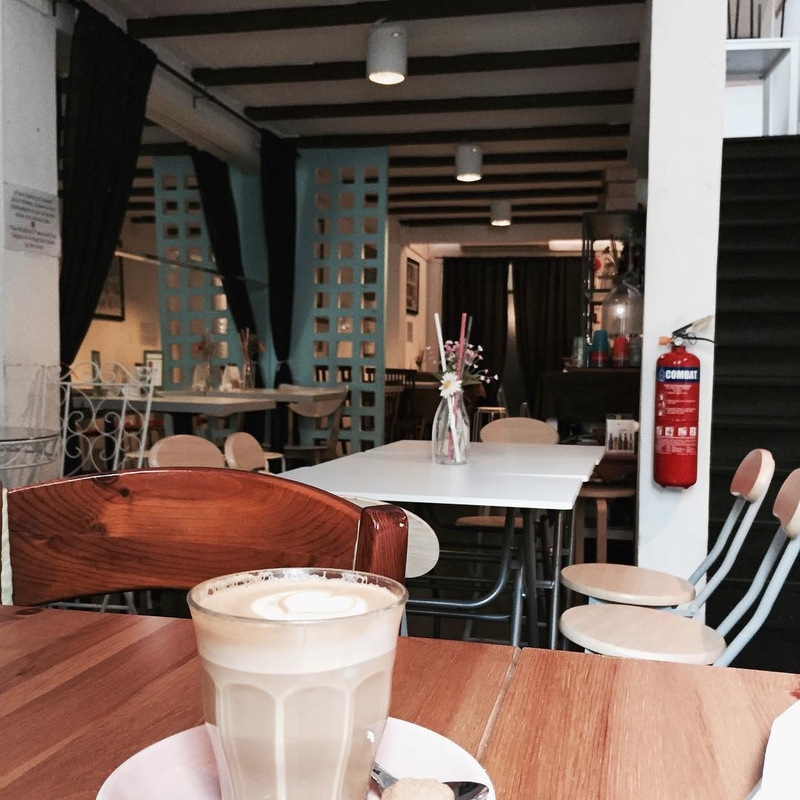 Decked out in a well-lit, industrial theme, it’s a great place to grab an afternoon cuppa and a light snack in the CBD. Coffee is firmly the focus here, with the richly-flavoured house blend showcasing beans from Brazil, Ethiopia and Colombia. Their standard Latte ($6.20 hot/$6.60 iced) is superb, as is their Cold Brew ($6.80), which comes encased in sleek, silver flasks. But, be sure to check out their specialty line for some innovative caffeine-laced creations. The Ondeh X Latte ($9.80) adds a local spin to latte with pandan milk, ondeh syrup and coconut flakes, while Sweet Little Rain ($9.80) is a stunning creation, with a ball of slowly-melting cotton candy draped over a cup of Americano. As implied by its name, Free The Robot is an android-themed cafe, with cute robot-inspired art and accessories everywhere you look. In the evening, this eccentric cafe undergoes a complete metamorphosis, becoming Bitter and Love, an uber-cool cocktail bar. 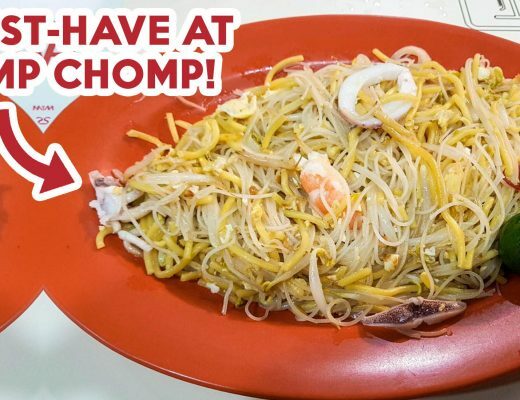 Affordable cafe food is increasingly difficult to find in Singapore, but this quirky joint offers some of the cheapest brunch bites in the CBD. Despite its relatively cheap price tag, the Free The Robot Burger ($12+) makes no compromise on quality. Unpretentious and satisfying, the burger is headlined by a juicy beef patty and robust rashers of bacon, with backup from a jiggly sunny-side-up egg. For a fresh start to the day that won’t empty your pockets, Muesli Greek Yogurt ($6+) and Free The Robot Signature Coffee ($6+) comes to mind, the latter being a coconut-oil laced espresso. 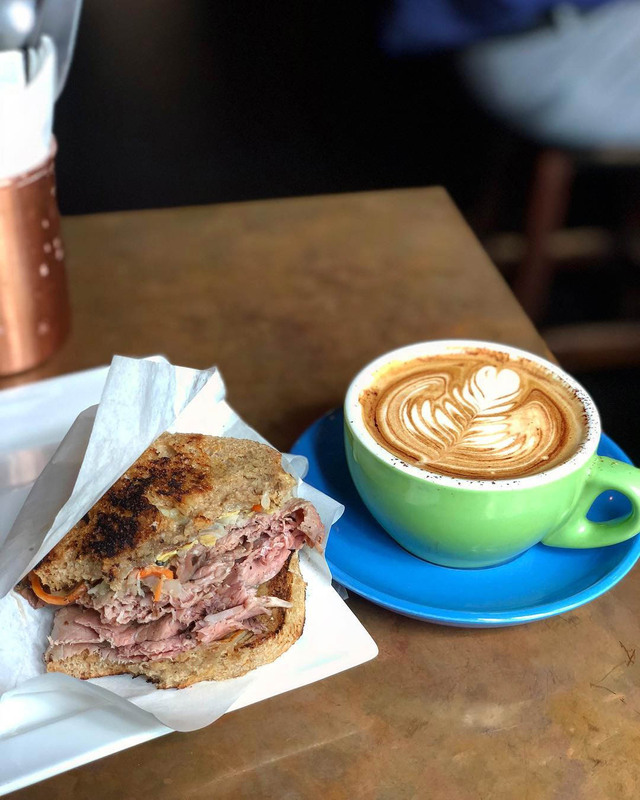 Park Bench Deli is arguably Singapore’s premier sandwich specialist, serving up a wide range of bread-based brunch options inspired by the classic American deli. 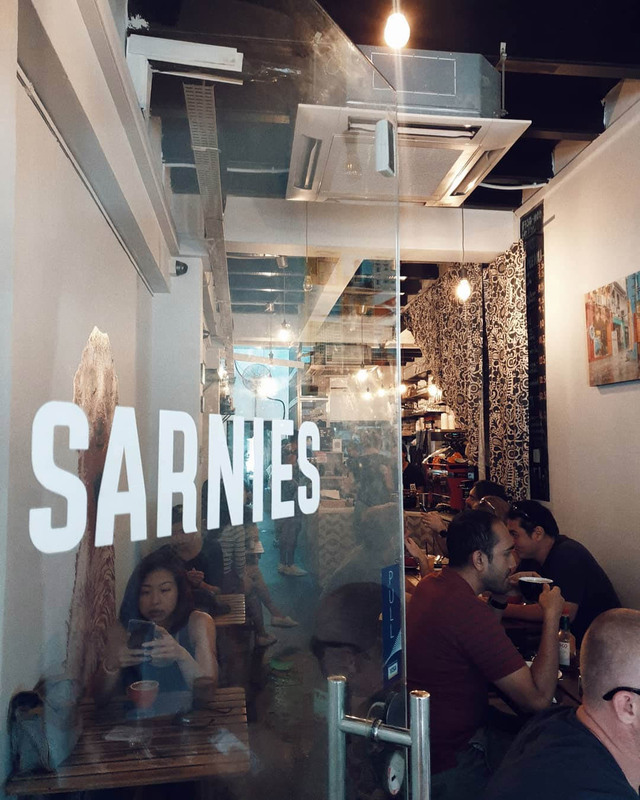 Located across the road from Amoy Street Food Centre, this perennially popular cafe is packed like sardines every weekend, so be sure to come at off-peak hours for a more relaxing sandwich experience. Philly cheesesteak is a decadent American classic that’s hard to find in Singapore, but the Cheesesteak ($18+) is one of their most popular items. Copious amounts of wafer-thin steak slices, sauteed onions and melted American cheese are crammed into a bread roll that somehow doesn’t get completely soggy. To sate your sweet tooth, PBJ ($8+) is the only option sandwich-wise. While it may seem like a steep price to pay for something that can be made at home in two minutes, this version kicks your Smuckers-and-Gardenia creation up a few notches. Feel free to disagree, but crunchy peanut butter is the only way to go for PBJs, and it’s paired with artisanal mixed berry jam here. The filling is then enveloped by cornflake-crusted, milk and chocolate bread that creates a crunchy and sweet outer layer. Be ready for a massive sugar rush. 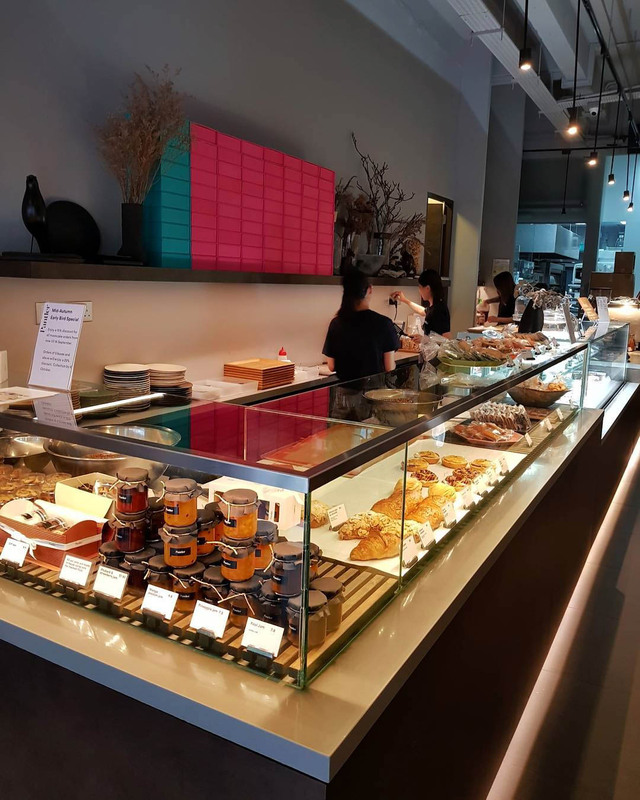 Across the road from Park Bench Deli, Pantler is a modern bakery and patisserie that delivers a selection of picturesque confectioneries. While the black logo may elicit numerous Black Panther references, “pantler” is actually a term meaning “a servant or officer in charge of the bread and the pantry in a great family”. 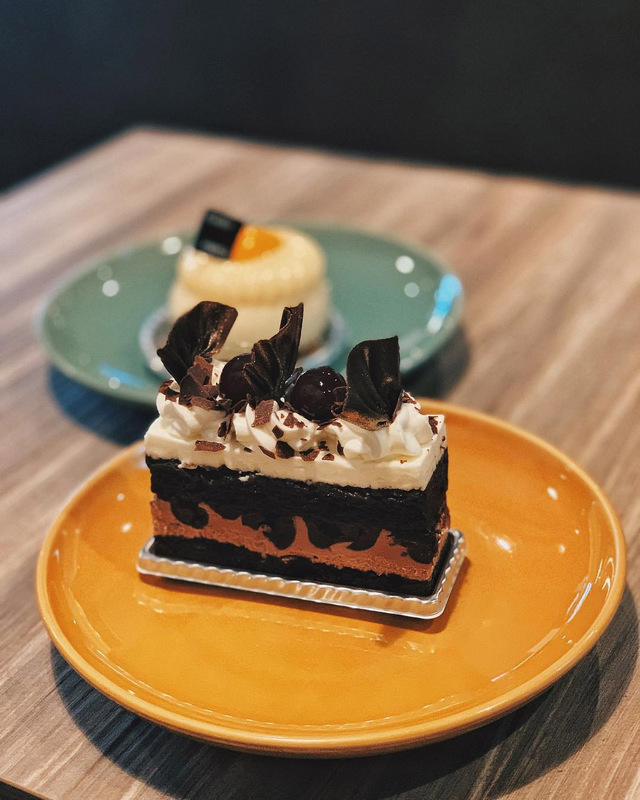 It’s a manifestation of the owners’ commitment to doling out seriously good bakes, as well as their efforts to create a familial atmosphere in the cafe. Yatsura ($8.50 for a slice) is their flagship cake; a cacophony of chocolate and hazelnut, perfect for people who eat Nutella by the spoonful. Cakes aside, an assortment of other baked goods is up for grabs, such as macaroons, cookies and tarts. Especially notable are their Chou A La Creme ($4.80), which has a mildly sweet and crunchy choux pastry encasing luscious cream. Dapper Coffee should be your go-to cafe if you’re in need of a bit of sparkle to brighten up your day. Its dark, woody colour scheme and rack of alcohol bottles create a strange fusion of cafe and bar vibes, which is understandable considering that it turns into gritty pub, The Spiffy Dapper, at night. Cocktail sensibilities from the pub make their presence felt in the cafe menu too, resulting in a range of photogenic coffees. Most popular is the sparkly, sky-blue Unicorn Tears ($10). 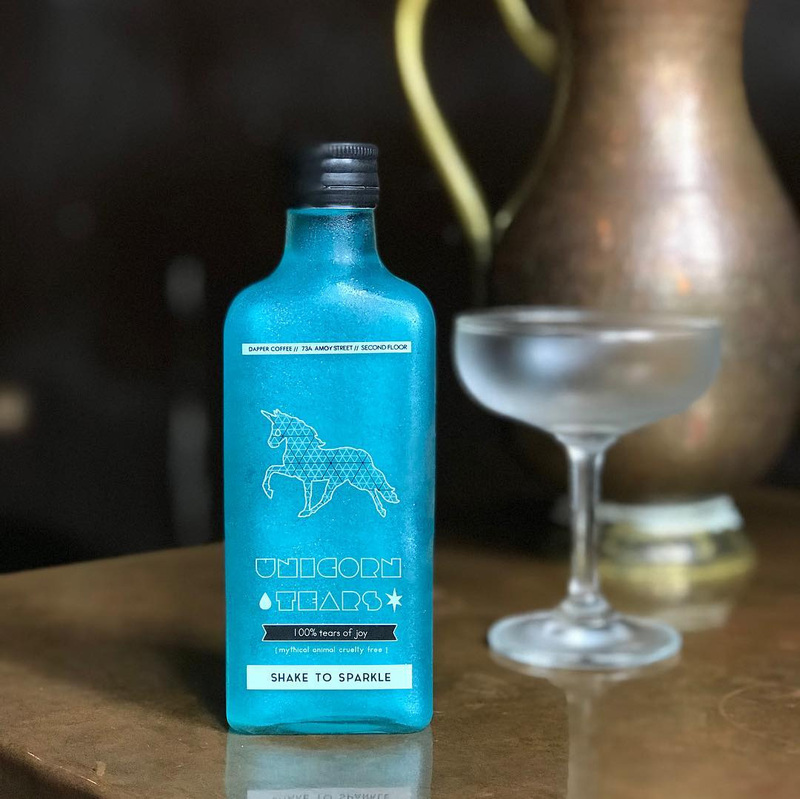 I’m not sure how comfortable I am drinking fluids from a mythical creature, but it certainly makes for an eye-catching IG story! There’s a series of house-made bakes up for grabs, but for a substantial meal, the kitchen has recently started sourcing from Sambal Time, an online nasi lemak peddler. They elevate this local favourite by adding customisability to every component, from sauce to carb, starting at $10. Choose from grains like Lemak Rice or Quinoa (add $3), proteins such as Grilled Mushroom and Grilled Chicken, and a multitude of sauces from Garlic Coconut Sauce to Hot Mexican Sambal to craft your perfect plate. 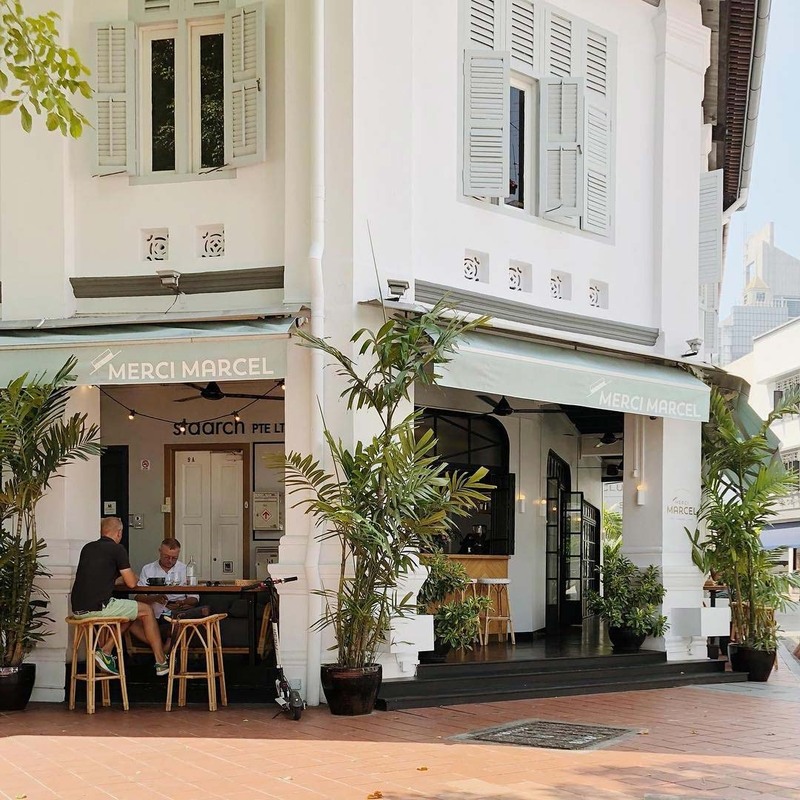 Telok Ayer is one of Singapore’s most popular cafe-hopping areas. And it’s easy to see why. 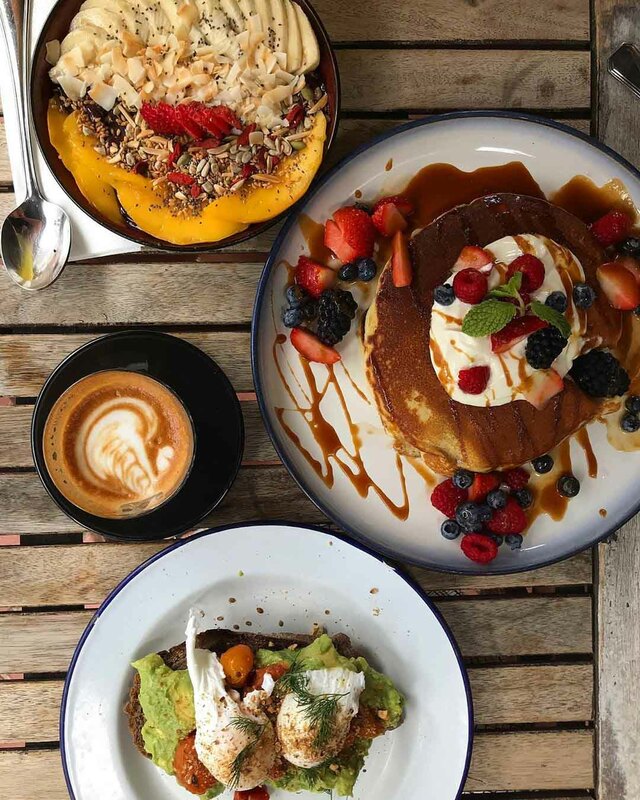 From classic Melbourne cafe experiences to quirky eateries with local flair and sleek patisseries, it’s hard to find a greater variety of cafe options in a single area. 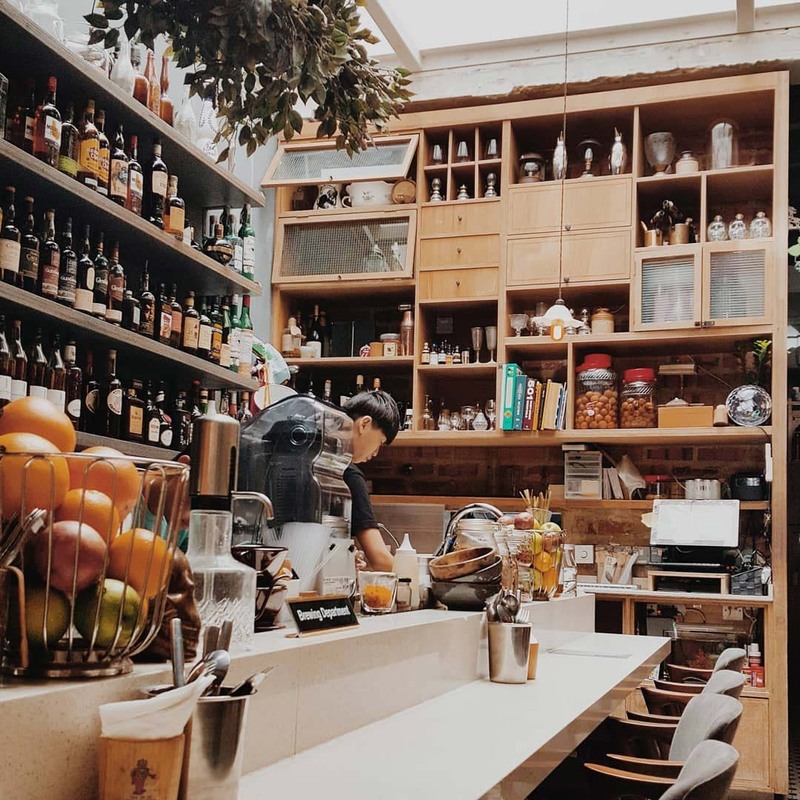 For more ideas to plan your next cafe-hopping jaunt, check out our articles on 11 Bugis cafes and 10 North-East cafes! Share your favourite cafes with us in the comments below. Featured image adapted from @aaronthh, @getcharred, @roland_of_the_lowlands, @sabrinahahhh, @marcellameilyne and v.imperatix.